Sometimes the best meals come about spontaneously. 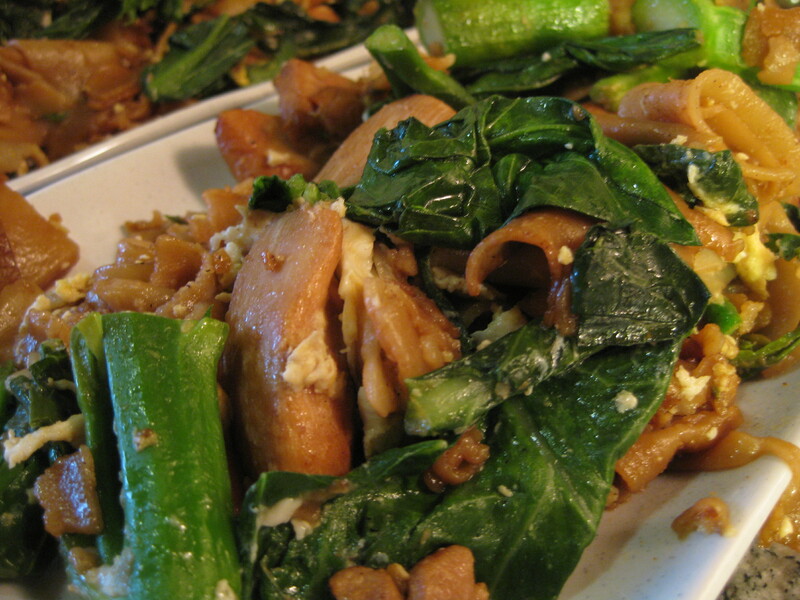 I’ve been meaning to make Pad See-Ew for a few weeks now, ever since my six-month-iversary with my girlfriend on July 4th (since we had also cooked Pad See-Ew together back on one of our very first dates). 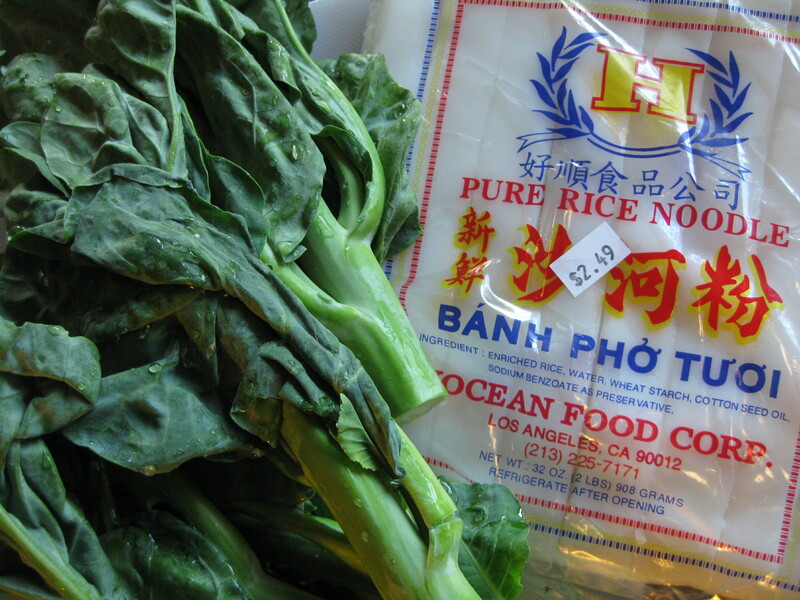 The only problem was that most of Santa Barbara’s little Asian markets were closed for the 4th of July, so we couldn’t get the right kind of rice noodles. We even went on something of a wild goose chase trying to track down a good-enough kind of noodle: a guy at Whole Foods (which was open on the 4th! ), told me over the phone that they had something close… nope. I don’t know what that Whole Foods guy was thinking; all they had were Shirataki yam noodles, and the similarly thin and even-more-fragile Tofu Shirataki. What I really wanted were fresh (not dried) wide, flat rice noodles like this. So we ended up making smoked salmon and avocado sushi rolls instead. Still a lovely six-month-iversary dinner, but it left my Thai noodle craving unsatisfied. Two weeks later– the “heat wave” (i.e., over 80) we’ve been having in Santa Barbara finally broken– I decided on a whim that Pad See-Ew would taste just as good on a weeknight, and wouldn’t actually take up a whole weekend evening of cooking. True! 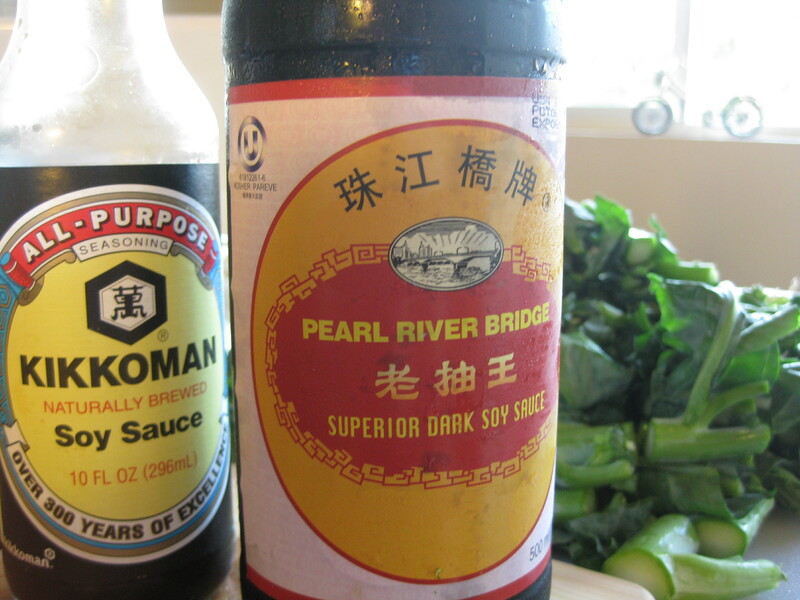 Once you have all the ingredients (the trickiest one is a thick/dark sweet soy sauce– see below), Pad See-Ew is actually pretty speedy to prepare! It requires fewer ingredients than Pad Thai, and is just an all-around easier dish to make… if you have the right kind of noodles. The thing is, I can’t be trusted at little Asian grocery stores to buy only what I go in for. Especially when I go in hungry. 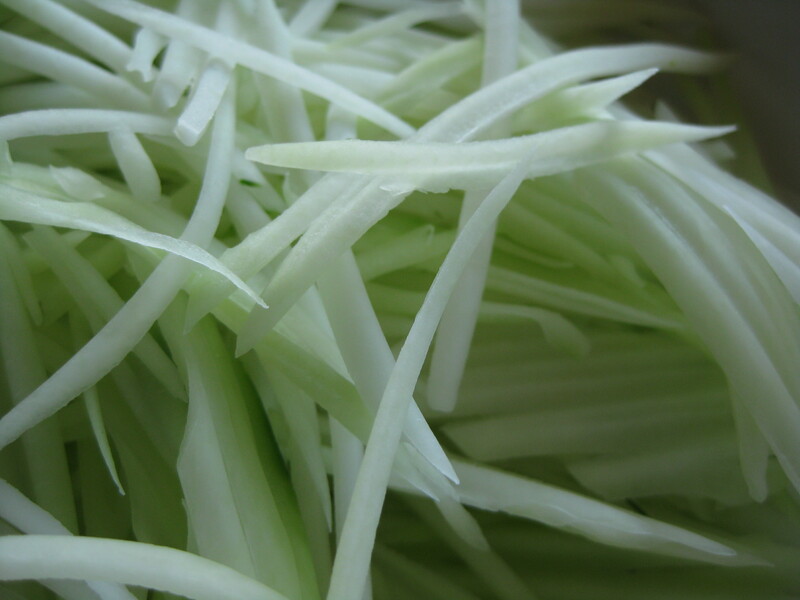 So I dropped in for fresh noodles, and also saw that the market was selling shredded green papaya. 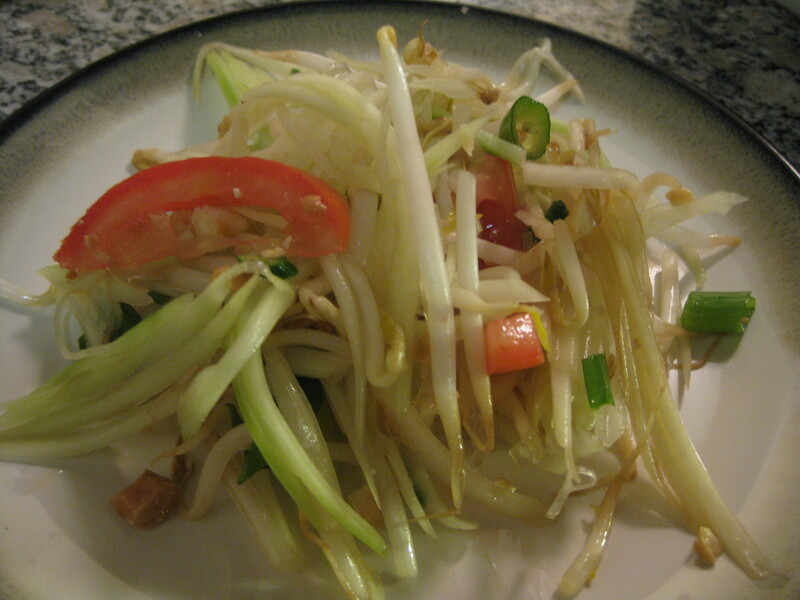 * In addition to the chicken, noodle, and Chinese broccoli (Gai Lan) dish, I decided to throw together a Som Tum spicy papaya salad. Once again, easy with the right ingredients. The two dishes complemented each other nicely: the salad was much spicier than the noodle dish, but also more refreshing. The chewy egg and umami-flavored noodles (which we topped with fresh lime and some generous dashes of Sriracha) felt like Thai comfort food, and the salad made a nice crunchy contrast of colors and textures on the side. One important disclaimer: given that this is my first-ever cooking blog post, I should probably confess something right here and now. I don’t measure things. I am more of an estimator, or a guesstimator, when it comes to cooking. ** Even when I make something for the first time, my strategy is often to skim through three or four different recipes for the same dish before I start, and then kind of mash them all into a “best of” in my head, and just start throwing in those best-of spices and herbs until it tastes right. Of course I often live to regret this strategy either when 1) something doesn’t turn out quite as well as I would have liked it to, or 2) something turns out SO DELICIOUSLY but then I am left powerless to re-create it exactly as-is, since I didn’t measure a thing. Nevertheless, I still highly recommend this cooking method. It allows you to tailor your cooking exactly to your own tastes, and also to become more comfortable with cooking– and what each of those individual ingredients is contributing– as you go. So although I’m planning to type up these recipes a.s.a.p. while the approximate amounts of everything are freshest in my memory (and the flavors are freshest on my tongue), I advise you, TOO, to not measure anything, and just to use these recipes as a rough guide. You’ll have more fun that way, and the results might even taste better, too. * And I splurged on some Thai iced tea-flavored popsicles… I couldn’t help myself. ** You can tell I don’t actually bake much… but maybe with this blog that will start to change. 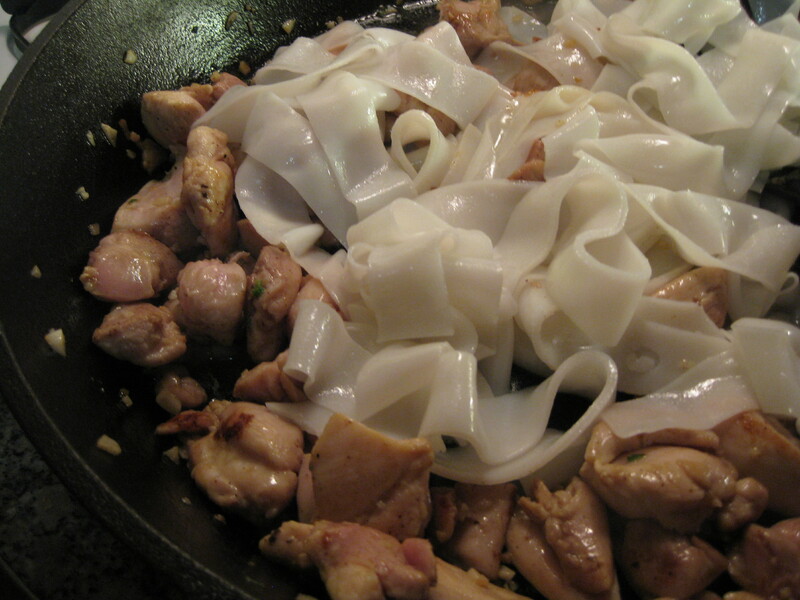 Use a pan where you can brown the noodles nicely, over high heat. I used a giant cast iron skillet, but even a large stainless steel pan would work, if you don’t mind having to soak it a little, pre-clean-up. 1. Heat the oil over medium heat, then add the diced garlic and chilis, and stir so they don’t stick or burn. 2. Add the chicken, tofu, or other meat, and stir occasionally until it cooks through. 3. Stir in the noodles, dark soy sauce, and regular soy sauce. Turn up the heat, flipping the noodles occasionally, but also giving them plenty of time to stick to the pan a little and start to brown. 4. Stir in the broccoli, and continue browning the noodles. Add sugar to taste. 6. Add pepper to taste. Serve warm with a wedge of lime and/or hot sauce (I used Sriracha). 1. 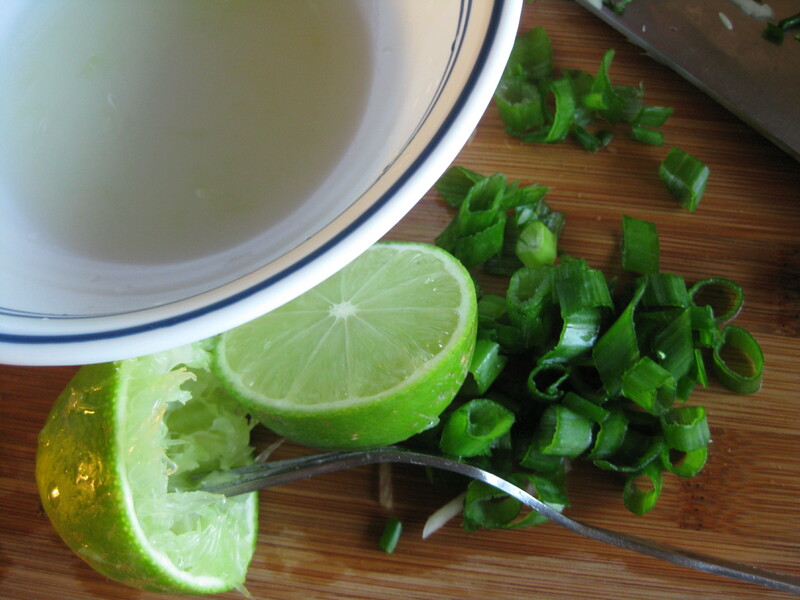 In a small bowl, mix ingredients for the dressing to taste, and set aside. 2. Julienne the papaya and place in large bowl. 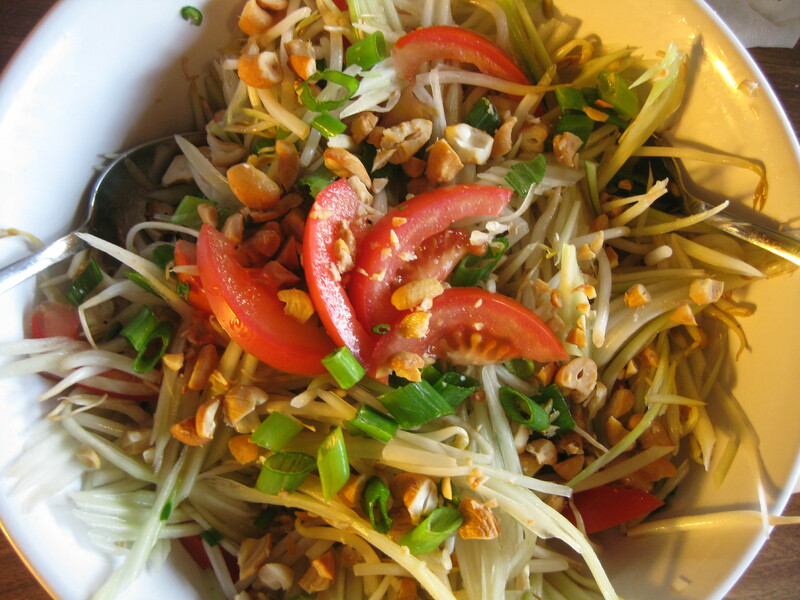 Add bean sprouts, green beans, dried shrimp, and tomatoes, and lightly toss everything together. 3. Stir or whisk the dressing one last time, then drizzle over salad and toss ingredients again. 4. 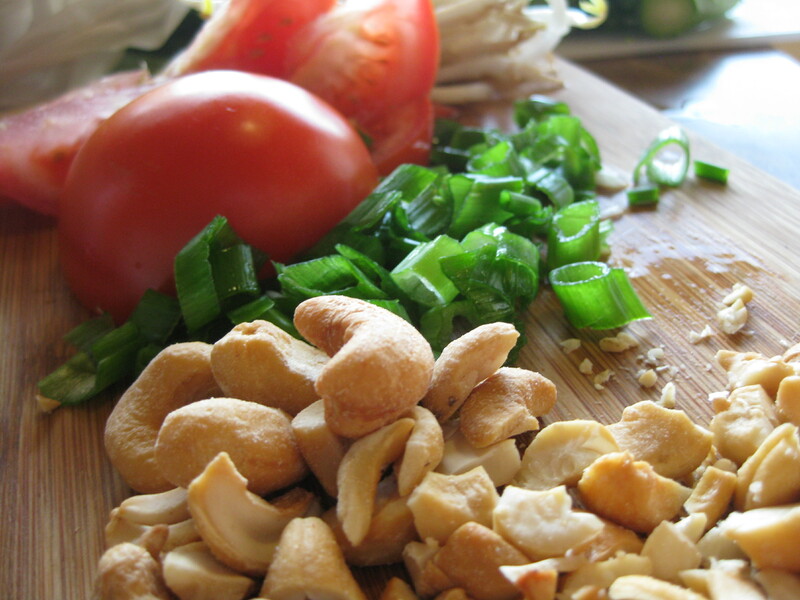 Sprinkle chopped peanuts/cashews and scallions over the salad. Serve cold (with a beer?!). It looks beautiful! Interesting blog. Keep it up. Looks good! 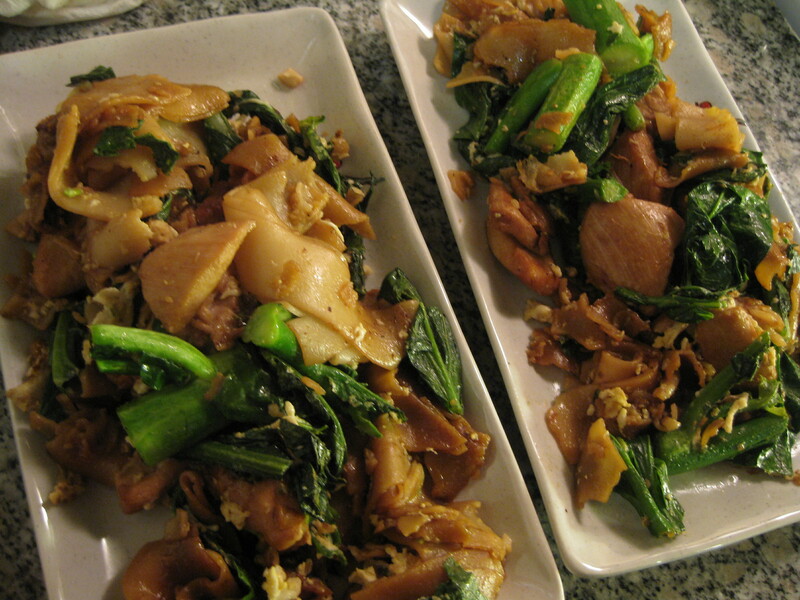 A actually had this last night at Sai Bai Thong, but it was called Pad-Ze-Ew. And yours looks better. But it was still delicious! Yay, I cook in just the same way, Allison! Nicely put. 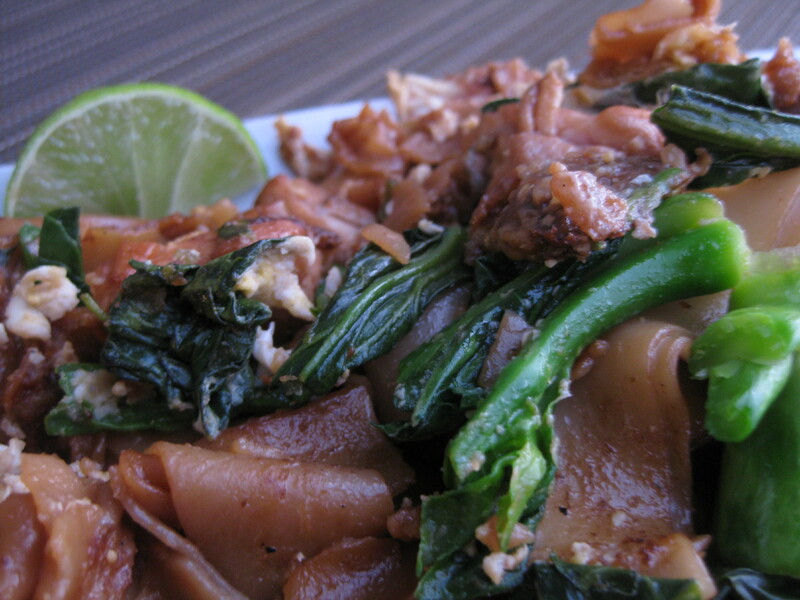 I can’t wait to try your Pad See Ew recipe. Alana, I’m glad to hear it :) Hope your pad see-ew turns out nicely! It looks amazing. Guess you were so happy with yummy Pad se-ew and papaya salad. : ) The nice part is that you don’t have to make the noodles too spicy at all! 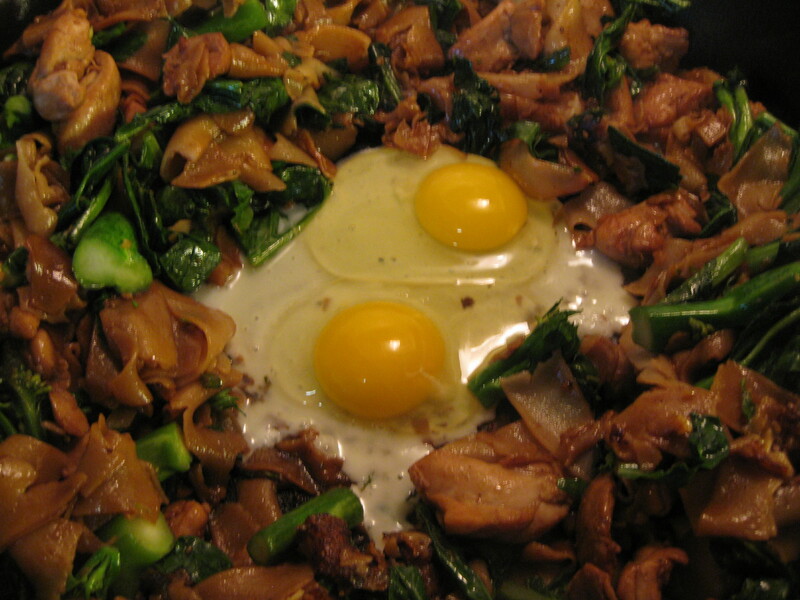 They can mostly taste like the yummy combination of egg and sweet soy sauce. Yes! I’ve been to Thailand, but not for long enough (and only to Phuket, Bangkok, and Ayutthaya)… I want to go back and go to the north, like Chiang Mai! I’ve been to Chaing Mai and I love it! Did u learn a lot of Thai? How long we’re u there 4? Only about a week, so sadly, no : ( Plus I was living in Japan at the time and booked my trip through a Japanese travel agency, so actually some of the people working at the hotels where I stayed, or driving tourist vans around Phuket, spoke to me and my friends in Japanese! It was probably my most typically “touristy” (<– not a good thing) travel experience ever, so that's another reason why I want to go back, spend longer there, and just explore more on my own! Have u ever been to Singapore? Yes! I absolutely love Singapore. I went there for 10 days, and I think they were some of the best 10 days of eating of my life. I love Thai food. i grew up there eating all the yummy food and this looks delicious :). Oh, and I don’t measure things either. Nice! I like knowing of other people who don’t measure things—it’s the way to go! (Especially if you’re tasting as you’re cooking.) You’re lucky to have grown up eating Thai food; I love it. I don’t make it often enough at all, but that’s partially because those are the kinds of restaurants I choose most often when going out to eat.